Citation: Niraimathi.R, Sasikala.M. (2015). A Network Lifetime Enhancement using Multi Heuristic Algorithm in WSN. 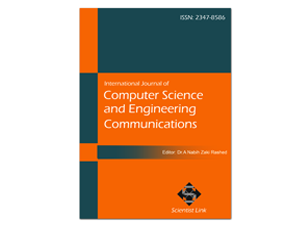 International Journal of Computer Science and Engineering Communications,Vol.3,Issue.2,pp.776-780. In wireless sensor network, the power resource conservation of sensors are limited so to extend the network lifetime of the WSN as long as possible while performing the sensing and sensed data reporting task, this is mainly serious problem in the network design. A sensor node delivers the sensed data back to the sink via multi-hopping method. The existing EASR method to enhance the large scale networks for avoiding the drawback of sensor nodes sending additional info about their residual energy, due to this more energy will be lost. Multi-sink heuristic algorithm has been extended to move the sinks in order to improve the lifetime of large scale sensor networks. Each sink knows its own position, others sinks positions and the locations of all the sensors. From the number of hops to reach the nearest sink, it is possible to estimate which sensors are distant and may have more residual energy. The sink knows its residual energy so it calculates the nearest hop count, after the calculation minimum hop count location will relocate the sink. Keywords- Wireless Sensor Networks (WSN), Multi-sink heuristic, Energy aware sink relocation, Sensor. A wireless sensor network (WSN) defines spatially distributed autonomous sensors to monitor physical cooperatively pass their data through the network to a major position. The enlargement of wireless sensor networks was motivated by military applications such as battlefield surveillance; today such networks are used in many industrial and consumer applications, such as business process monitor and control, mechanism of strength monitor. InWSN is built of "nodes" – from a few to several hundreds or even thousands, where each node is connected to one (or sometimes several) sensors. Each such sensor network node the size of a grain of dust, although functioning "motes"(demo video) of genuine microscopic dimensions have yet to be created. has typically several parts: a radio transceiver with an internal antenna. A sensor node might vary in size from that of a shoebox down to the size of a grain of dust, although functioning of genuine microscopic dimensions have yet to be created. Sensor nodes are distributed in a sensor field to observe a phenomenon of interest (i.e., environment, vehicle, object, etc.). Sensor nodes in the sensor field form an ad hoc wireless network and transmit the sensed information (data or statistics) gathered via attached sensors about the observed phenomenon to a base station or sink node. The sink node relays the composed data to the remote requester (user) via an arbitrary computer communication network such as a gateway and associated contact network. while unusual applications require special communication network infrastructures to efficiently transfer sensed data, WSN designers can optimize the communication architecture by determining the appropriate topology (number and distribution of sensors within the WSN) and communication infrastructure (e.g., gateway nodes) to meet the application’s requirements. An infrastructure-level optimization called bridging facilitates the transfer of sensed data to remote requesters residing at different locations by connecting the WSN to external networks. Wireless sensor network survey has suggested that a wireless sensor network (WSN) has important applications such as remote environmental monitoring and target tracking. It has been enabled by the accessibility, particularly in modern existence, of sensors that are less important, cheaper, and intellectual. These sensors are operational with wireless interfaces with which they can communicate with one another to form a network. The intend of a WSN depends extensively on the appliance, and it necessity consider factors such as the position, the application’s propose objectives, and cost, hardware, and system constraints. Yi Zou.Student Member IEEE and Krishnendu Chakrabarty,IEEE Member, ‘’A Distributed Coverage- and Connectivity- Centric Technique for Selecting Active Nodes in Wireless Sensor Network’’ IEEE Transaction On Computers,vol. 54, NO. 8, JANUARY-AUGUST 2005 . Huang.S.C and Jan.R.H, “Energy-aware, load balanced routing schemes for sensor networks,” in Proc. 10th Int. Conf. Parallel Distrib. Syst., Jul. 2004, pp. 419–425. Jain and D.P.Agrawal, “Current trends in wireless sensor network design,” Int. J. Distrib. Sensor Netw., vol. 1, no. 1, pp. 101–122, 2005. Kalpakis.K, K.Dasgupta, and P.Namjoshi., “Efficient algorithms for maximum lifetime data gathering and aggregation in wireless sensor networks,” Comput. Netw., vol. 42, no. 6, pp. 697–716, Aug. 2003. Karkvandi.H.R, Pecht.E, and Yadid-Pecht.O, “Effective lifetime-aware routing in wireless sensor networks,” IEEE Sensors J., vol. 11, no. 12, pp. 3359–3367, Dec. 2011. Monaco.U, F.Cuomo, T.Melodia., F.Ricciato., and M.Borghini., “Understanding optimal data gathering in the energy and latency domains of a wireless sensor network,” Comput. Netw., vol. 50, no. 18, pp. 3564–3584, Dec. 2006. Mousavi.H, Nayyeri.A, Yazani.N, and Lucas.C, “Energy conserv- ing movement-assisted deployment of ad hoc sensor networks,” IEEE Commun. Lett., vol. 10, no. 4, pp. 269–271, Apr. 2006.